Jeffrey was a postal worker with psychopathic tendencies. Four years prior to 7.15 Repo Man, Jeffrey was possessed by a demon who allowed him to express his murderous desires. Like many psychopaths, Jeffrey is very gifted at feigning innocence and helplessness to lull people into a false sense of security around him. He uses this to separate Sam from Dean, allowing him to lead the latter blindly into a trap. Due to his frailty, Jeffrey used sedatives to overpower his victims. Hallucifer points out this inconsistency to Sam, reasoning that a demon would be more than strong enough to commit the murders without drugs. Jeffrey describes the method in which he builds his "list": he hears a whistling sound coming from the victims' brains which compels him to follow them home. Originally he lacked the nerve to pursue them further before his possession. He claims to be in love with the demon and enjoys the excitement of being connected to something so powerful. This is similar to Lucifer's statement whilst possessing Sam: "You can feel it, can't you? The exhilaration!" It is also reminiscent of Jimmy Novak's "...kinda like being tied to a comet..." description of being a vessel. Given the likelihood of going to Hell, Jeffrey will no doubt become a demon himself in due course, but would never again play host to his tutor. The demon started murdering the women on Jeffrey's "list" and removing various organs from their bodies Jack the Ripper style, before being tracked down and captured by the Winchesters with help from a Wiccan, Nora Havelock. Sam and Dean were hunting the arch-demon Lilith at the time and interrogated the Jeffrey!Demon for information on her lieutenants. The demon released control for a few minutes, allowing the Winchesters to ask for Jeffrey's permission to torture the demon. Feigning remorse, Jeffrey permitted them to do whatever it takes to stop the demon before being taken over by the demon again. Sam and Dean tortured Jeffrey!Demon into revealing the name of a higher-up, a demon called Merrick. After hearing that they can find him in New Orleans, Dean exorcises the demon and dropped a severely beaten Jeffrey off at the hospital while Sam cleaned their DNA out of the farmhouse. 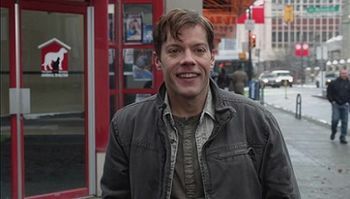 Over the next four years Jeffrey fell into a deep depression and started drinking, resulting in him losing his job and speaking about his experiences to other people. This led to him being committed and spending some time in a mental institution before joining a live-in therapy group. To most he seemed to be recovering from a troubled past, but in truth he was suffering from separation anxiety from his exorcism. Jeffrey began researching ways to summon demons from Hell to bring his demon back and sought Nora's expertise, but she turned him away. The next day he kidnapped her son from his dorm room and demanded her help in exchange for his return. Nora translated a spell for Jeffrey but it didn't work and he refused to return the boy, instead sending her his severed ear to motivate her to find a demon summoning spell that will work without exception. She was then able to decipher another ritual that would work, but Jeffrey still kept her boy hostage and told Nora to send the Winchesters to him when they came. In the meantime, Jeffrey started carrying out more murders from his "list," having gathered the courage from his possession and, ironically, a new sense of determination from his guidance counselor (albeit unwittingly). The murders attracted the attention of the Winchesters, who returned to investigate with Nora's help again. They visited Jeffrey in the chance that he was possessed again, but found out he was human after splashing him with holy water. 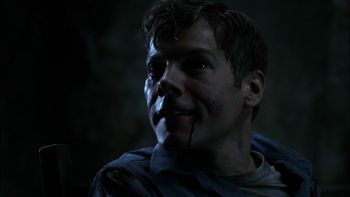 Jeffrey tricked Sam into pursuing a potential victim, Marjorie Willis, thereby allowing him to lead Dean to his "nest" where he kept Nora's son captive. When Dean tried to release the boy, Jeffrey injected a sedative into his neck and tied him up. When Dean awoke, Jeffrey prepared the summoning ritual and explained that he actually enjoyed being possessed and considered the demon the "love of [his] life." He then took some of Dean's blood and used it along with the heart of his newly adopted pet dog to complete the summoning. The demon however, chose to manifest himself in Nora's son instead. Jeffrey!Demon congratulated him on realizing his potential but refused to possess Jeffery again, much to his dismay. Dean broke free from his binds and attacked the demon, but was overpowered. Having learned the truth from Nora, Sam appeared in time to save Dean by drawing the demon into a devil's trap. Jeffrey attempted to intervene by stabbing the demon with Ruby's knife but Dean shot him, killing him and sending him to Hell. Nora then exorcises the demon, saving her son. Later at the motel, Sam muses out loud about how Jeffery was pretending to be the victim when he was possessed back at the farmhouse. Dean says that he's a psychopath who, like all others, "act like they're not 'balls to the wall' crazy." Jeffrey's character may refer to Jeffrey Dahmer, who murdered 17 men and boys between 1978 and 1991. Jeffrey's rockabilly haircut, country accent, and Detective Sutton's "cold-blooded" remark may refer to Richard Hickock, killer of the Clutter family in 1959, as told in Truman Capote's non-fiction crime novel In Cold Blood.